A preview of what's ahead in politics for the week beginning 4 December 2017. This week I'll endeavour to update this if/when I see upcoming events. Cabinet meets today, which means around 3.30/4pm we'll have the usual post-Cabinet press conference. Look for Prime Minister Ardern to come under pressure over Shane Jones' work for the dole scheme, which he appears to have announced without Cabinet approval. This is at least the second significant announcement the government has made without going through Cabinet, so questions are starting to be asked about whether the Labour-led government has its backroom in order yet. Statistics NZ is releasing goods and services trade by country, essentially a way to see who our largest trading partners are. The parties all have their caucus meetings, so watch on Twitter and Facebook from around 9.30am as the various leaders and MPs speak to media on their way to caucus. Prime Minister Ardern and National's Bill English seem to get their stand ups live streamed on Facebook by at least Stuff.co.nz, though WiFi and 4G reception is patchy in the bowels of Parliament House, so the streams can drop out. The House continues which means Question Time and progression through the Order Paper, of which the provisional Order Paper is available on Parliament's website. 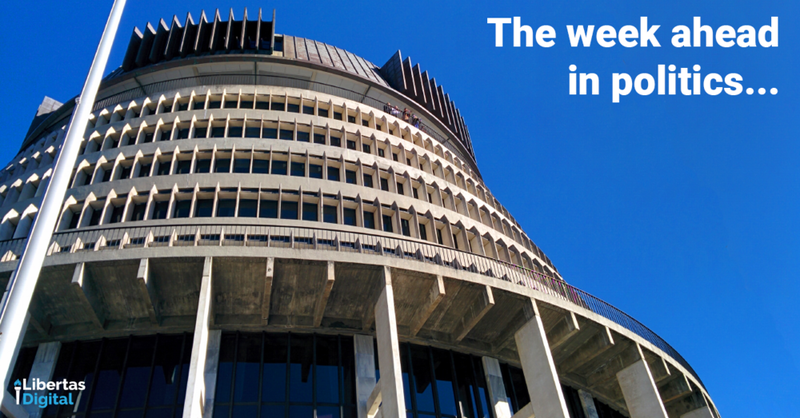 Parliament is also scheduled to sit right until Thursday 21 December, and Chris Hipkins suggested last week in the House that while Labour wasn't going to be using urgency this week, it was likely to need to use it in the final weeks of this sitting bloc. Statistics NZ releases the value of building work put in place for the September 2017 quarter. I'd expect this to be static to slowly growth than earlier in the year, a combination of both election uncertainty being reflected in this dataset as well as a plateauing housing market. UPDATE: The government has announced that 80,000 students will benefit from its fee free policy for first year courses from 1 January 2018. UPDATE: Prime Minister Ardern will take part in an Al Gore lead 24 hour international discussion on climate change (from about 5pm New Zealand time) - the Climate Relay Project. House sitting. I believe this Wednesday isn't a Members' Day. Statistics NZ is releasing their Local Authority Statistics, essentially a snapshot of the financial health of local government, though it's looking at the whole rather than breaking it down into individual councils. Statistics NZ releases the wholesale trade survey data, a snapshot of retail sales, especially good for looking at data like machinery or motor vehicle sales. UPDATE: Briefings to Incoming Ministers will be released. UPDATE: Prime Minister Ardern will be visiting the Mana electorate with Kris Faafoi (Mana stretches from Porirua through to Raumati on the Kāpiti Coast, though the joke on the Coast is that as nice of a guy that Kris is, he thinks the electorate stops at Pukerua Bay). Statistics NZ releases both the Economic survey of manufacturing and their subnational family and household projections. UPDATE: Prime Minister Ardern will be visiting the Waiariki electorate with Labour's Māori caucus. UPDATE: By Friday the report into the gastro outbreak in Havelock North should have been released.